You don’t have to follow the yellow brick road to appreciate the Land of Oz. Oz Matilda, that is. 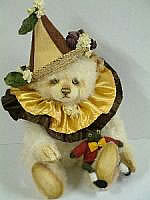 From down under, Lisa Rosenbaum has designed her bears to be as fabulously unique as she is. 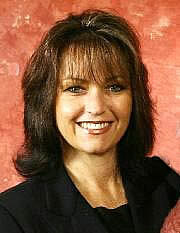 As a child, Lisa suffered from hearing loss due to a tumor, which left her with only a portion of her hearing. As a means of expressing herself, she turned to painting, drawing and poetry; winning her first art prize at the tender age of nine. law part-time at Sydney University. She met and married her husband, a builder, while serving on the force. When she became pregnant with her first child, Ashleigh now 15, Lisa painted the nursery with a teddy bear picnic theme. Foreseeing an opportunity, her husband started making children’s furniture for her to paint too. Many of their friends wanted the pieces of hand painted furniture. “My stepmother, who was a doll maker back then, mentioned that the furniture would be great accessories for dolls and bears”, Lisa said. “So we thought there might be a marketing opportunity and we attended our first show; taking all the finished pieces available,” Fortunately, a buyer from Singapore, who was opening a chain of bear shops, spotted her work and purchased almost everything. 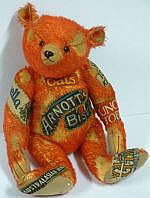 The retailer of the Singapore Shop asked if she could make teddy bears from fur and that is how it all started. With two other children added to her family, Hayden (11) and Eliza Victoria (6), Lisa’s style has developed and parlayed into a thriving business. 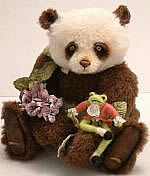 Since 1992, she has been creating old-style bears and beautiful hand painted belly bears. Lisa attends two International shows per year; the Walt Disney Epcot show and the Expo in Washington, D.C. The distance doesn’t seem to bother the die-hard collectors who fly in from Ireland, Japan and Switzerland just to meet her. “The majority of our sales today are done through my Private Membership Club and retail orders”, she stated. 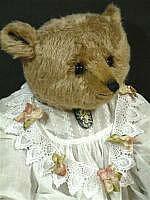 Collectors who know her workmanship have asked for specialized bears created just for them. Lisa has built a personal relationship with the majority of her collectors, knowing exactly what they wish and require. With awards ranging from Golden Teddy Nominee (her first year of competition), to the Toby Industry Choice Awards, Lisa has made a name for herself in the industry she loves. 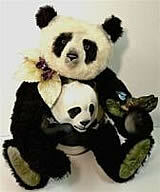 She received worldwide recognition in 2003 for her prototype of a hand-painted canvas on a bear’s tummy. 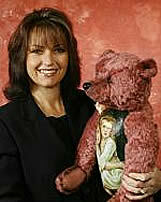 The bear set a new world record price at auction of $17,700.00 USD for a sole artist. 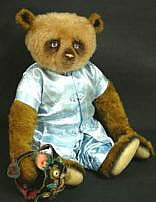 The teddy bear named “The Master Painter”, now resides in Ireland. We can look forward to many inspired works of art from Lisa in the coming years. Professional members can access the continued story of how Lisa promotes her worldwide successful business by clicking to B2B on the home page.